HELP US! - JOIN OUR MOVEMENT! HOW? SIGN UP - THEN SPREAD THE WORD! Firstly, we need to educate our fellow citizens directly and by encouraging press coverage to produce a large grassroots group of advocates. Secondly, we need to have those advocates press lawmakers to reform our tax laws. This page provides suggestions, tools, and information to do both. I CONSTANTLY SEND THE IDEAS PRESENTED IN WEBSITE TO FRIENDS, NEWS OUTLETS, PUNDITS, AND POLICY MAKERS. I POST ONLINE. I WALK THE STREETS OF ANY US CITY I VISIT WITH A FAIRSHARE SIGN AND HAND OUT POSTCARDS (BOTH BELOW). YOU CAN DO THE SAME TO MULTIPLY MY EFFORTS MANY-FOLD. Click here for a list of influential people who you can write to about the Fair Share Tax plan. 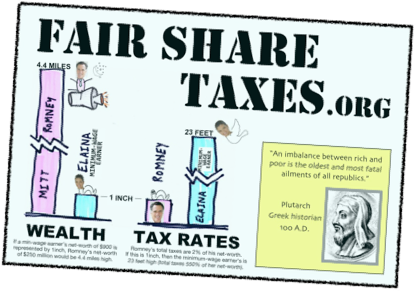 There you can download and send FairShareTax Summary.pdf or one of these FairShareTaxes blurbs.doc. Click here for fax numbers and addresses for Congress (the 2012 easy to use list). Click here for the updated 2013 but less convenient listings for Congress. Fax or mail the FairShareTax Summary.pdf to as many Congressmen as possible. Faxes are preferred for Congressmen since snail-mail is often delayed a month or more due to security concerns. Email the following paragraph to all the contacts in your email address book who may be interested. Post it on Facebook. Post it in online comments in websites. 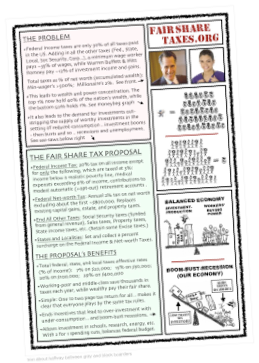 Download FairShareTaxes blurbs.doc if you would like to send longer versions describing our unfair tax system and the Fair Share Tax Plan. Mail of fax my printed two-page FairShareTax Summary.pdf to your friends, the media, policy makers, law-makers, anyone you can think of. 1600 Pennsylvania Ave. Washington D.C.
Write a letter to the editor of a local or national newspaper mentioning this website. Contact information for many newspapers can be found at this webpage. 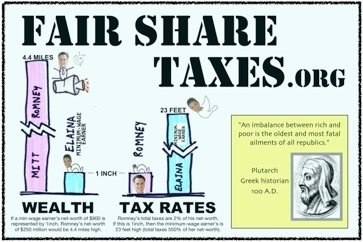 Download and manufacture Fairshare Bumper Sticker.pdf for your car rear window or bumper. Mention the website in web-posted comments and radio talk-shows. WANT 4x6 POSTCARDS LIKE THIS TO HAND OUT? QUIZ: For 30 years the Republicans have claimed their tax cuts to the wealthy would stimulate the economy and create jobs. Over those thirty years how much has the best measure of the strength of the economy, GDP growth, changed (compared to the prior 30 years)? How much have those tax cuts contributed to the National Debt? ANSWER: GDP growth has dropped 25% since the Republicans started cutting taxes on wealthy investors, claiming it would stimulate the economy. The cost to the US Treasury has been about $10,000,000,000 (ten trillion-over half our national debt), which we and future tax payers (especially wage-earners under the current tax system) will eventually need to pay - with interest. This Republican’s failed stimulus cost more than 10-times more than Obama’s much-criticized stimulus that saved us from a second Depression of the Republican’s making. FAIR SHARE TAX REFORM: A comprehensive tax reform plan for federal, state and local governments, that reduces total taxes on the working-poor and middle-class by thousands each year, encourages stable economic growth, vastly simplifies our tax laws, and slashes the national debt. Put links to this website in blogs, your website, Twitter, or Facebook page.